"It Was Horrible to Watch"
Attorney General Michael Mukasey was given a "clean bill of health" and went back to work Friday after his harrowing collapse at a late-night dinner speech. The 67-year-old Mukasey, accompanied by his wife, Susan, told reporters and cameras at midday Friday that he felt "excellent" as he stepped into a van for a ride back to the Justice Department. Mukasey never transferred his authority to a deputy during the time when he was rushed to George Washington University Hospital late Thursday and while there under observation during the night. He passed a host of tests Friday, he said, including a treadmill stress test, an MRI and a CT scan. "As you may have heard, I collapsed briefly last night at the conclusion of a speech," the retired federal judge said in a late-morning e-mail to his departmental staff. "All tests at the hospital have come back with good results, and I feel fine," Mukasey's e-mail said. "Thank you for your good wishes and your good work. It has been and remains an honor to serve with you." 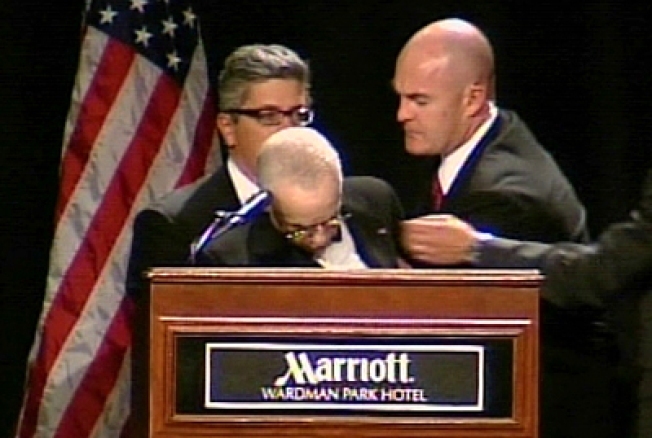 Mukasey's collapse during an appearance before The Federalist Society evoked memories of similar frightening episodes, including then-Commerce Secretary William Daly's plunge from a stage at the Old Executive Office Building during the Clinton presidency and an incident in which then-President George H.W. Bush took sick at a dinner in Tokyo and had to be checked out by his personal physician. A Justice spokeswoman, Gina Talamona, had said earlier Friday: "The results are in. Everything looks great." She reported that that Mukasey had passed a treadmill stress test, a stress echocardiogram, CT scan and an MRI. She also said doctors ruled out a stroke or cardiac problem. "He's in good shape," she said. Talamona also said that physicians specifically had ruled out TIA — or transient ischemic attack — which is a mini-stroke. Talamona noted that Mukasey had had a very busy day before going to a Washington hotel to give the keynote speech to a black-tie dinner of the society, a conservative-oriented legal group. During the talk, he began to slur his words, nodded, turned and started to collapse when he was caught by men standing nearby. Mukasey opened his speech on terrorism with a wry remark about expecting the mood at the dinner to be "somber or sober." He slumped over the podium about 15 minutes later and could be seen swaying and shaking slightly just before he collapsed and briefly lost consciousness.